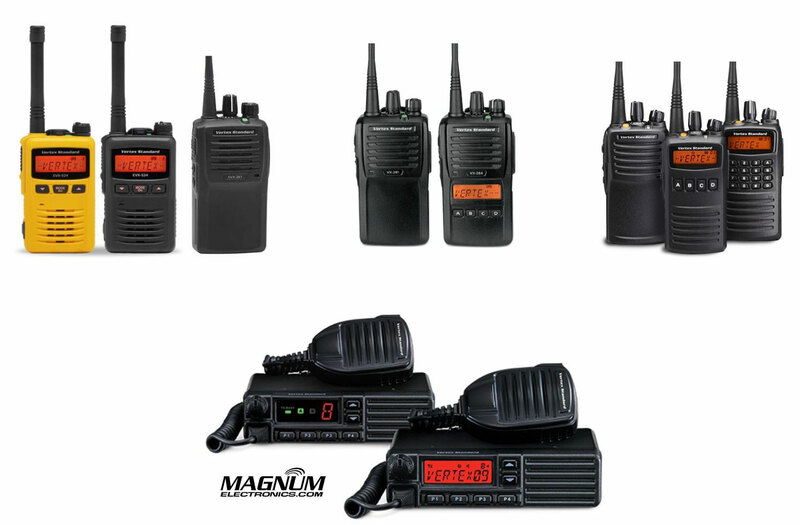 Vertex Standard Products Transition To Motorola Solutions on 1/1/2018 | Magnum Electronics, Inc.
Motorola Solutions will retire the Vertex Standard brand this month. The digital eVerge EVX-261, EVX-S24, analog VX-260 series, VX-450 series, VX-2100, and VX-2200 will be rebranded with the Motorola logo. The eVerge DMR EVX-261 and EVX-S24 are compatible with all Motorola MOTOTRBO digital radios. The last day we can place new orders for Vertex branded equipment is 12/31/17. The following Vertex eVerge and P25 products and associated accessories will end production at the end of this month,. Warranty repairs will be honored by Motorola and support is planned for another 5 years. The programming software will remain the same. If your Vertex radio or accessory has been cancelled, contact our office and we can recommend a replacement. This entry was posted in Motorola, New Products, Vertex-Standard and tagged 2-way radio, communications, DMR, eVerge, P25, Vertex-Standard by magnumelectronics. Bookmark the permalink.